“Nathaniel Hall from Everyone's Drumming makes this drum for me and it is unique in that the playing surface is wooden as opposed to a skin head. This woodtop Djembe Cajon is handcrafted in Putney, VT by Everyone's Drumming using Vermont Maple for the shell and 5 ply high quality birch for the head. The shell has a walnut finish coated with 4 coats of polyurethane. The head has a hand rubbed oil finish with the Matt Abts Signature Logo on it. 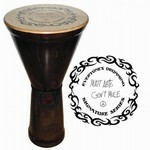 This Djembe Cajon offers warm, rich tones, slaps that attack and a deep low end. A carrying handle is hand woven around the center of the drum. Each drum comes with a free djembe bag . This drum has been handcrafted to Matt Abts Specifications with the greatest attention to detail.